Riggan Thompson (Michael Keaton) is a washed-up actor famous for having once played a world-famous comic book superhero in three blockbusters. Since dropping out of the franchise, however, his career has steadily gone downhill. At the same time, the Birdman persona he once assumed in those movies has slowly taken over control over him. In order to revive his declining prospects, Thompson signs on as leading man, writer, director, and co-producer in a Broadway piece based on Raymond Chandler’s story “What We Talk About When We Talk About Love” by his best friend Jake (Zach Galifianakis). When the most important supporting actor drops out right before the premiere, Riggan recruits the renowned stage thesp Mike Shiner (Edward Norton) – which leads to further complications. The new star is quite a handful, threatening to outshine Thompson and creating havoc within the female cast of Laura (Andrea Riseborough) and Lesley (Naomi Watts) in particular. Then there’s a lawsuit against Riggan, the notoriously fickle New York Times critic Tabitha Dickinson (Lindsay Duncan), and Thompson’s own daughter Sam (Emma Stone) who has just been released from drug rehab, is hired as a production assistant, and hooks up with the philandering Shiner. First and foremost, Birdman is a black comedy about actors and acting, but the film is also a tale of rejection and the need acceptance. It affects all the characters. We witness them going through the motions and see how volatile and vain what they perceive as success really is. The schizophrenic Riggan oscillates between his own, struggling personality and the Birdman character all the time. There’s a constant voice in his ear telling him that he would be invincible if he just behaved like the superhero again and causing the line between reality and fantasy to blur for Thompson frequently. Likewise, Mike Shiner may look ultra-confident on the surface but is a really troubled man beneath. The same goes for the two main ladies in the Broadway production, who are each racked by self-doubt, as well as Jake and Sam. Michael Keaton is exactly what the doctor ordered for the role of Riggan. Until he took off the Dark Knight’s suit after Batman Returns, his career trajectory looked eerily similar to that of one Tom Hanks. In fact, since Beetlejuice he had been a Tim Burton favorite of sorts for the quirkier parts in the filmmaker’s movies. After Michael Keaton’s exit from the role of the masked vigilante, he almost vanished from the Hollywood landscape for some time and has never returned to his lofty previous career heights again. So he can tell a thing or two about what it feels like to drop off a proverbial cliff. Alejandro González Iñárritu and Birdman, of course, constantly toy with their leading man’s erstwhile larger-than-life persona. The casting of Michael Keaton as Thompson is therefore like a match made in heaven; no-one else could have personified the troubled actor better than him. The funniest scene in the whole movie is probably when Riggan accidentally locks himself out of the theater right before he is supposed to go on stage for the dramatic finale during one of the previews and must cross Broadway in his underpants to make it back to the playhouse in time. It’s no surprise in the information age we live in that he emerges as the laughingstock of the next day in the papers and on the internet video platforms. If you screw up, at least do it in style. Hiccups like that are what push Thompson to the ledge several times in the course of the movie, particularly because the Birdman persona constantly tells him that is indeed invincible and can fly. Riggan finally goes out in dramatic fashion, first blowing off his nose before then heeding the words of his alter ego to jump off the sill of his hospital window. The Oscars for Best Direction and Best Cinematography are well-earned, not only because Birdman is a work of technical dexterity that would make other directors proud. The movie often gives you the impression that there are virtually no cuts in it. As the line between reality and dream blurs for Riggan, so it does for the viewers. Alfred Hitchcock’s black comedy exercise in style, Rope, only employed eleven shots in about eighty minutes. Birdman uses more but, thanks to digital manipulation and brilliant camerawork by Emmanuel Lubezki, looks as if it used even less. While the film may not be as flashy as some of the blockbusters and only uses such scenes to hint at Riggan’s distorted mind, Alejandro González Iñárritu excels in such sequences as much as in the more subtle directions he employs during the theatrical passages. It’s no wonder that the intriguing mix between big-budget superhero movie and intimate play impressed the Academy. Then again, it’s not really surprising, either, that the Hollywood appreciation society gave the nod to something that displays the mechanisms and struggles of its own trade. 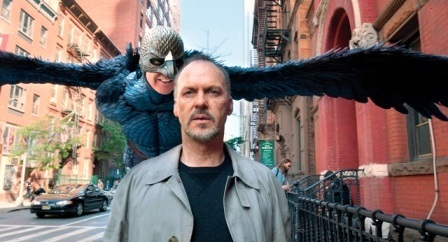 Whatever the reason for the Oscars, Birdman is a deserving winner, although some of the surprise effects might be less spectacular when giving it a second or third go. The Monster Is Loose: Andrei Zvyagintsev’s Leviathan as a Parable of Putin’s Russia?